At first glance at the words above from St. Paul to Timothy, it was if St. Paul were speaking direct to my heart at a time that I needed it the most. The words are a reminder that 8 years ago I experienced the “imposition of laying on of hands” from a wonderful Bishop who admonished me to always trust in God. And now, I was being again admonished…that in my Diaconal Ministry, God expects me to boldly bear witness to Him with the spirit of empowerment…that my armor is a spirit of love and self-control. In my Diaconal Ministry, I am called to be a living testimony to Christ and must bear any hardship for the Gospel…because the indelible seal of the Holy Spirit will provide me all the strength necessary. Yes, these words spoke direct to me personally…and it is my hope that my brother Deacons and all Ordained Ministers embrace these words and accept, as I have, the admonishment in a spirit of love and dedication to ministry. My friends in Christ, whether Ordained or Laypersons, regardless of our faith tradition or Christian affiliation, today’s Scripture is a reminder that each of us has been given a gift from God that must be “stirred into flame.” As people of faith, we are lovingly admonished by Jesus that He has empowered us to love and live with self-control…to boldly proclaim the Gospel, accepting both the hardships of service and strength provided by the Holy Spirit. Can. 1039 All candidates for any order are to make a spiritual retreat for at least five days in a place and manner determined by the ordinary. Before the bishop proceeds to ordination, he must be certain that the candidates properly made this retreat. 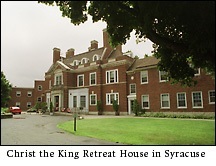 The upcoming Canonical Retreat for the 8 men in their final year of diaconate formation and their wives at Christ the King Retreat House, Syracuse, N.Y. confirms the wisdom of the Catholic Church in prescribing, by Canon Law, that all candidates for ordination set time aside. Time to complete a final discernment… time to pray… to laugh… to learn… to enjoy good food and great company. The canonical retreat will be a spirit-filled time in an environment designed to provide space to reflect on four years of growing together and the changes about to occur as each of these couples takes their place in a ministry that is still being defined! May the Holy Spirit fill their time with a peaceful resolve to serve God’s people and the courage to fully embrace their vocational call. Putting deacons in their place? …while deacons are enabled to serve the people of God in the diaconate of the liturgy, the word and charity. According to Zenit and the National Catholic Reporter, the change brings the canon in line with the Catechism of the Catholic Church and clarifies the role of bishops and priests, as distinctly different than permanent deacons. Makes sense? As I read the change, the “while” in the new paragraph has a “line in the sand” quality… a demarc point that doesn’t reflect the balance of the current canon. I am always interested in another perspective on the Permanent Diaconate… particularly when the author is able to articulate “the stuff” behind our ordained ministry. Of course, it’s never without a bit of controversy. In the Catholic Church, the Permanent Deacon’s ministry is considered to be a three-fold ministry of service: Table, Word, Charity. The “eucharistic table” embraces the call to the sacramental/liturgical aspect of the diaconate: from altar to baptismal font. In “word”, the deacon’s call to preach and teach the Word is foremost. And finally, “charity” draws the permanent deacon into the community: prison, social justice and service in the wider community. The conversation that surrounds defining the diaconal ministry should be welcome by all: the present “Permanent Diaconate” is an infant ministry compared to the others in the church. Granted, we tend to accept those first 7 men who were called by the apostles (Acts 6) as the first “deacons”. It’s been centuries in the western church, however, since that first call to service has been realized. Let me know what you think of Joseph Michalak’s article from The Catholic Spirit. You can either follow the link above directly to the publication or download the pdf below.